ADMISSION: $10 for adults and $7 for children, students and senior citizens. Admission is always free for Museum members. Tickets may be purchased online at morrismuseum.org, by phone at 973.971.3706, or in person at the Morris Museum. The Morris Museum’s Bickford Theatre is located at 6 Normandy Heights Road in Morristown, NJ, and offers free parking and full accessibility. Box office hours for phone sales are Monday through Friday, 10:00 a.m. to 5:00 p.m. This new exhibit at the Morris Museum features work by designers Paige Gardner, Amber O'Boyle Kulp and Colleen O'Neill. It showcases a selection of women's and men's costumes and accessories that illustrate the eclectic and individualistic nature of steampunk fashion today. To provide a historical context for the six costume ensembles on display, 19th-century Victorian Era clothing and accessories from the Morris Museum’s permanent collection have been integrated into the installation, highlighting the design connections and deconstructions that oftentimes serve as the inspiration for steampunk costumers. Fashion is one of the many subcultures of the steampunk movement—including art, design, literature, music, film, video and toys—that arose from the visual aesthetics of steampunk fiction in the 1980s. 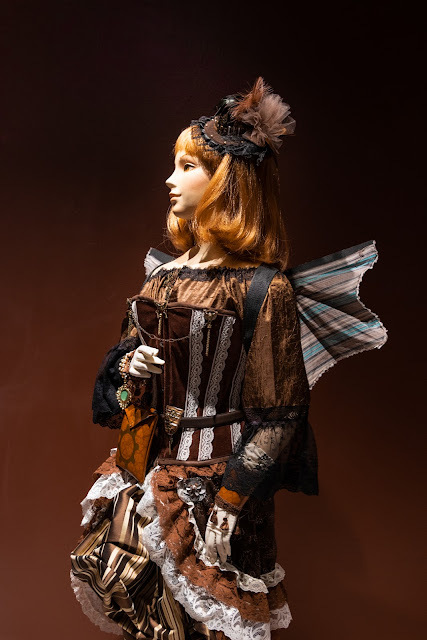 In the world of Steampunk, attire serves as an extension of "cosplay," or costume role-playing, in which participants represent specific characters or personas known as "steamsonas." Popular steamsonas include pirates, military, explorers, inventors, ladies, gentlemen and Wild West characters. Designers intentionally conflate interpretations of 19th-century high-style attire with mechanical elements that evoke technological advancements of the period, such as gears and goggles, to create the traditional retrofuturistic steampunk aesthetic. Stylistic tropes range from wearing undergarments such as corsets on the outside, to fantastical accessories such as flying machine-like wings strapped on like a jetpack. From hats to spats, the Victorian Era elements in the exhibition were chosen to show how the trends of the 1800s have influenced steampunk fashion. Giving a nod to the technology and inventions of the day are curious artifacts such as a stereoscope, Magic Lantern and tailboard camera, as well as art and furnishings. recreations are mixed with gears, moving parts, and attitude, conveying a message of practicality, romanticism, adventure, and self reliance. Thus the fashion becomes not only art, but an artistic outlet for self-expression and creativity." 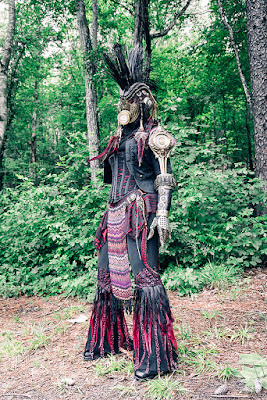 Paige Gardner is a costume artist based in Birmingham, Alabama. She is known for her unconventional approach to costume by assembling rather than sewing. Amber O'Boyle Kulp is a designer based in Pottsville, Pennsylvania, specializing in steampunk, renfaire (Renaissance faire), and cosplay costumes. She is founder of KISS Designs. Colleen O'Neill is a steampunk accessory designer based in Oxford, New Jersey. Her shop, The Roguish Rabbit, was established in 2013. Four of the six steampunk costume ensembles were made expressly for this exhibition. While some are traditionally Steampunk, others push the boundaries and foreshadow future trends. Men's character ensemble (2019) as a Scottish Highlander, a collaboration between Amber O'Boyle Kulp (costume) and Colleen O'Neill (accessories), with mechanical wings once used onstage by steampunk band Eternal Frontier. Display of 19th-century women's undergarments, deconstructed to show the various layers from the inside out, including bloomers, underpetticoat, hoop skirt, petticoat, corset, and corset cover, any of which steampunk costumers may use as an outer layer. Currently on view through August 11, 2019 at the Morris Museum, is a related exhibition, A Cache of Kinetic Art: Simply Steampunk, the second installment of the four-year juried exhibition series, A Cache of Kinetic Art, celebrating the Murtogh D. Guinness Collection of Mechanical Musical Instruments and Automata. Following the success of last year's inaugural exhibition, this year explores the theme of steampunk art─incorporating the aesthetics of 19th-century industrial design and steam engine machinery─through 18 works of kinetic sculpture by 12 artists that were selected by a jury of practitioners in the field. The artwork on view ranges in scale from jewelry to room-sized installations, and in scope from traditional retrofuturistic sculpture to more broadly-interpreted light and soundscapes. These imaginative creations are marvels of design, engineering, storytelling, and fantasy that demonstrate the ingenuity of steampunk art today. Founded in 1913, the Morris Museum is an award-winning, community-based arts and cultural institution serving the public through its exhibitions in the arts, sciences and humanities. The Museum is home to the historic and internationally-significant Murtogh D. Guinness Collection of Mechanical Musical Instruments and Automata. Changing exhibits of contemporary content also explore the Guinness themes of art, sound, and motion. The adjacent Bickford Theatre is the museum's 312-seat performing-arts facility, offering unique programming, often related to the museum's exhibition themes. Continuously serving the public since 1913, the Morris Museum has a proud tradition of innovative educational programs and family events. The first museum in New Jersey to be accredited by the American Alliance of Museums, it has been designated a Major Arts Institution and has received the New Jersey State Council on the Arts’ Citation of Excellence, among other awards. The Museum is open Tuesday, Wednesday, Thursday, Friday and Saturday, 11:00am to 5:00pm and Sunday, 12:00 to 5:00pm. In addition, the Museum is open evenings from 5:00 to 8:00pm on the second and third Thursday of the month. For more information, call 973.971.3700, or visit www.morrismuseum.org.